One of the nick names I have for my friend Cindy is “Cookie Mama” because she makes the most delicious cookies that are so beautiful you don’t want to eat them! At our Home For The Holidays craft fair last weekend she introduced a new design, this double sided snowflake cookie. Cindy is also extremely gifted at making Gingerbread Houses. Every year at our Home for the Holidays craft fair we look forward to seeing her display. I managed to take a quick picture as she was setting up her display. 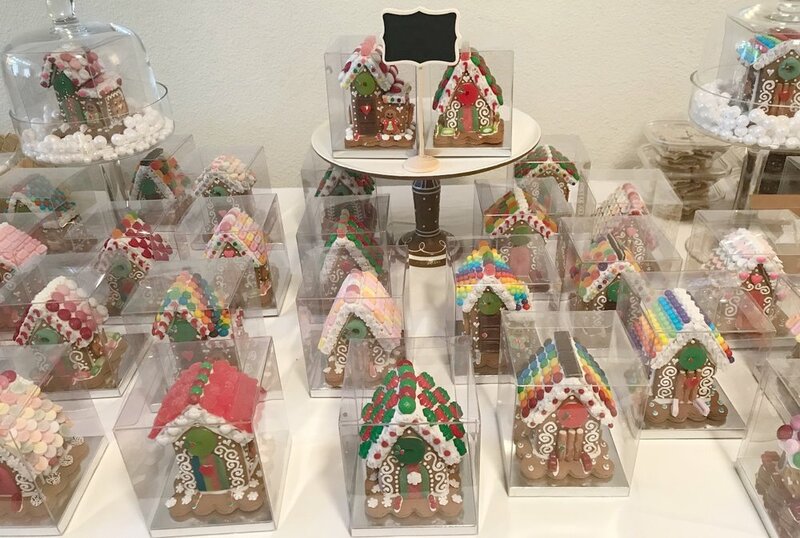 When people come to purchase her gingerbread houses they often take a long time to choose which one they want because they are all so unique and special. It’s fun to closely examine all the special little details Cindy puts on each house, they are truly a labor of love. Cindy just celebrated her birthday. Since her birthday is just before Christmas we often combine her birthday celebration with some late night Christmas shopping. We didn’t have a particular theme for our birthday dinner for Cindy so I decided to create a card for her that would be appropriate for the Cookie Mama that she is! I created Cindy’s card using the stamp set, Cookie Cutter Christmas. I embellished the gingerbread cookies with Santa’s Workshop Enamel Shapes. I added three balloons that were punched out with the Balloon punch in various colors. The sentiment comes from the stamp set Calls For A Celebration. The background of this card was created with a new product, the Dot to Dot Textured Impressions Folder..that is from our new Occasions Catalog that will be available in January. When Cindy opened her card she smiled and thought the gingerbread cookies were so cute. As we headed out after dinner to shop we saw these decorative red ornaments. We instantly thought of our friend Lynn who we are missing so much since she moved to Seattle. We plan on sending her these pictures and hope that when she sees them she will remember how much we love and miss her. I am thankful for the opportunity we had to celebrate Cindy’s special day! Happiest Birthday Wishes to our sweet and talented friend Cindy aka, “Cookie Mama”, we are so grateful for you!